Novelist Guanlong Cao's autobiographical account of growing up in urban Shanghai affords a rare glimpse into daily life during the forty turbulent years following the Communist Revolution. 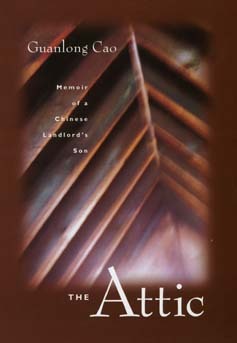 Forced to the bottom of Chinese society as "class enemies," Cao's family eked out a meager existence in a cramped attic. The details of their day-to-day existence—the endless quest for enough food, its preparation, Cao's schooling and friends, the stirrings of sexual desire, his dreams and fantasies—are brought brilliantly to life in spare yet evocative prose. The memoir illuminates a world largely unknown to Westerners, one where human pettiness, cruelty, joy, and tenderness play themselves out against a backdrop of political upheaval and material scarcity. Reminiscent of the concise style of classical Chinese memoirs, Cao's lean, elegant prose heightens the emotional intensity of his story. Perceptive and humorous, his voice is deeply original. It is a voice that demands to be heard—for the historical moment it captures as well as for the personal revelations it distills. Guanlong Cao is the award-winning author of the trilogy Three Professors, published in China and translated in Roses and Thorns: The Second Blooming of the Hundred Flowers in Chinese Fiction, 1979-80, edited by Perry Link (California, 1984). He has also published Male River and Adam Parkinson in China, and he has twice won the prestigious Shanghai Literature Award. He emigrated to the United States in 1987 to matriculate at Middlebury College as a 42-year-old undergraduate. He now holds a Master of Fine Arts degree from the School of the Museum of Fine Arts at Tufts University. His artwork includes sculpture, photographs, paintings, and prints.